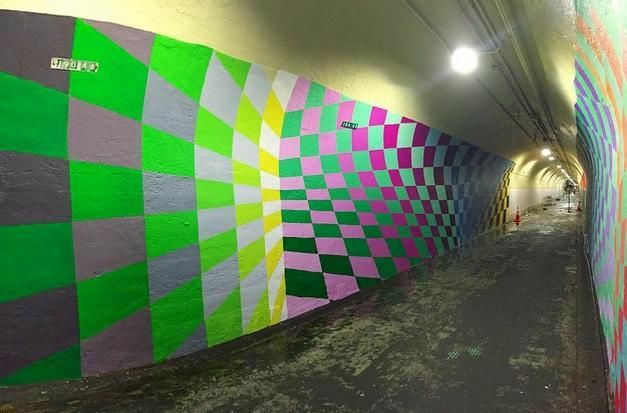 First of all, kudos to the six artists that just painted the pedestrian tunnel up at 191st Street: Nice one! Over 158 people applied to get the gig. But doesn't it seem a little ironic that the Department of Transportation -- the city's bastion of "broken windows" subway buffing -- has now assumed the roll of street-art curators? Did the previous tags really need an authorized go-over sponsored by the DOT? If the original artists didn't have to keep looking over their shoulder for transit cops, they probably could have done a better job. Maybe they should be given the opportunity to go over some of the "bad art" elsewhere in town. A B34 bus would surely look better with something other than end-to-end GAP ads. The murals by Andrea Von Bujdoss (Queen Andrea), Fernando Carlo Jr. (Cope2), Nick Kuszyk, Nelson Rivas (aka Cekis), Jessie Unterhalter and Katey Truhn are now on view in the 900-foot tunnel that runs between Broadway and St. Nicholas Avenue in the Bronx.